I’m very excited that my friend Carl Magnus Palm is writing a revised, updated, and expanded version of his first ABBA book, The Complete Recording Sessions.With so much more information that has come to light since the book was published in 1994, through Carl Magnus’s research for other ABBA book, CD, and DVD projects, and because it’s long out-of-print and highly in demand, the idea of a new version of this book is something we’ve talked about for several years. I’ve been honoured to read draft versions of the first four chapters, covering the period from Benny and Björn’s first collaborations in 1966, through the gradual formation of ABBA, and up to the end of 1974. The most recent versions of the chapters include all the latest details and insights gleaned from Carl Magnus’s unique opportunity to listen to the unreleased studio tapes from the so-called Polar Archive. Particularly fascinating to me is learning just how much work went into the recording of ‘Waterloo’, as ABBA worked to create the song that would have the most impact for the Eurovision Song Contest. How instruments and vocals were added and removed from the song, how many different mixes were attempted to find the right sound, how the song was edited to fit within the mandated three minutes, and why the various released versions (in Swedish, English, German, French, the alternate English mix, and the playback version used at Eurovision) sound a bit different from each other. But it’s not just ‘Waterloo’ that’s got me excited. As ABBA’s recordings became more ambitious, when they began recording tracks for their third album later in 1974, they tried and discarded so much that was never heard on record, that will now be revealed in the book. Though we will probably never hear what’s on those tapes, they are described in such detail that we can imagine what they sound like. I can’t wait to read what the rest of the chapters hold and what future research brings to the book. I’m really looking forward to the end of next year when we should all be holding copies of the book in our hands (and/or on our devices). 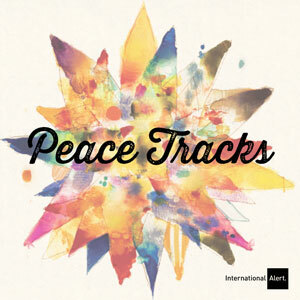 To commemorate International Peace Day on 21 September, the Talking Peace Festival 2015 and International Alert gathered musicians from around the world to collaborate on a musical project, Peace Tracks. ABBA are part of this project, with two songs featuring an ABBA connection. Track 3, ‘Coupé in C Minor’ features a sample of the piano riff from ‘SOS’, while the final track ‘Soldiers 2015’ builds on the drums and bass of ‘Soldiers’. Amazingly, these samples have been approved by ABBA, only the third time sampling of ABBA recordings has ever been officially authorised by the group. One of the most unusual ABBA records ever released is this one, imaginatively titled ABBA & Rubettes, featuring hits by, you guessed it, ABBA and British group The Rubettes. It’s quite a strange album, with seven songs by each band. The cover is a not particularly attractive mash-up of ABBA’s 1975 self-titled album and Rubettes’ album We Can Do It released the same year, bisected with a diagonal yellow band with the song titles ‘I Do, I Do, I Do, I Do, I Do’ and ‘I Can Do It’, plus the apparent random phrase ‘Stop Stop Stop’, which isn’t an ABBA title and doesn’t seem to be a Rubettes title. 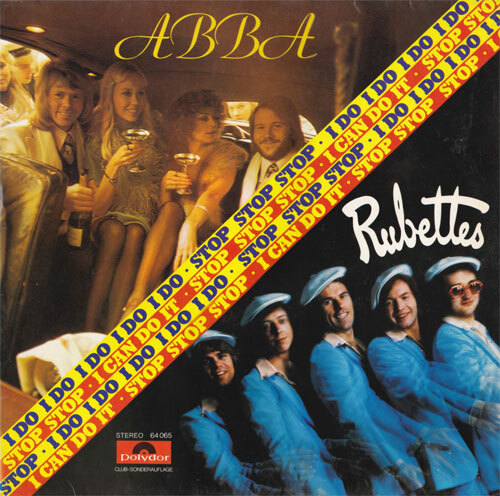 Five of ABBA’s seven songs come from the ABBA album, but only two Rubettes songs come from We Can Do It, the others from other albums and singles. The album was released in 1975 by Polydor In West Germany through the record club Club-Sonderauglage. I’d seen images of this record on the net many times, but had never seen the record itself until I found a copy a few weeks ago at my favourite local record shop. Trivia: The Rubettes hit ‘Sugar Baby Love’ which is on this album also featured in the 1994 Australian movie Muriel’s Wedding, alongside ABBA hits ‘Dancing Queen’, ‘Waterloo’, ‘Fernando’ and ‘I Do, I Do, I Do, I Do, I Do’. More trivia: Rubettes’ creators and songwriters Wayne Bickerton and Tony Waddington wrote the English lyrics for Lena Andersson’s 1972 single ‘Better To Have Loved’ (Säg det med en sång) and ‘Cecilia’, written by Benny, Björn and Stig Anderson. ‘Säg det med en sång’ was their submission for that year’s Melodifestivalen. Bickerton also produced the Swedish and English recordings.